Why am I frustrated when I forgot my Apple ID security question answers? If you forgot your answers for you Apple ID security questions, you will be frustrated and you not alone. Thousands of users like you are frustrated, because there is no easy way to recover or reset Apple ID security questions. 1. You have entered the Apple ID and password. 2. Apple verifies them and they are correct. 3. For some reason, Apple decided to double check your identity by asking you to answer your security questions. 4. For some reason, you forgot the answers. That is reasonable, because you created your account a while ago, and you wrote down the answers on a piece of paper. And now you cann't find that piece of paper. 5. You try to answer the question by guessing it. Of course, Apple returns with an error. Now you getting a little bit frustrated now. 6. Now you see link on the screen and it says "Reset Security Questions". You think that link will allow you to change the security questions and reset answers. 7. You click the "Reset Security Questions" link. Apple displays a new screen that says: "Answer Your Current Security Questions". 8. 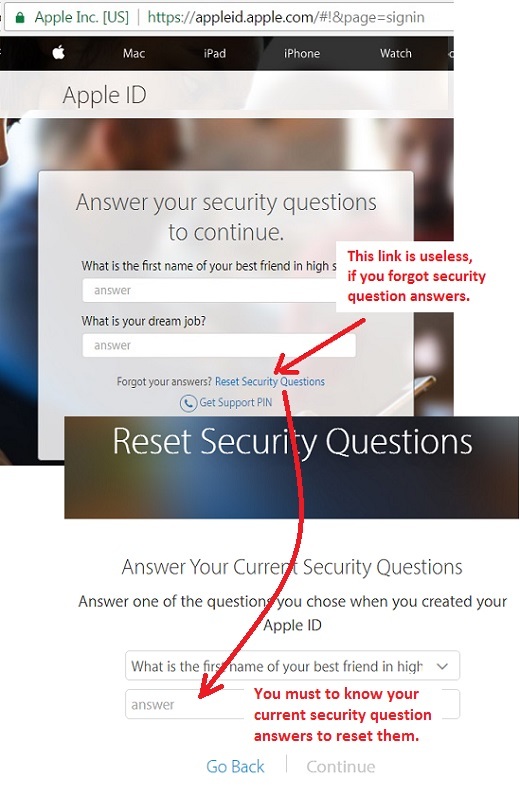 Apple wants you to answer the security questions that you forgot the answers and try to reset them. You are getting really frustrated now. What should you do? Maybe search the Internet and to see if there is any help instructions.  2019-03-20 FYIcenter.com: Why not? Leave your name in a comment, if you support this idea.